Peniche, Portugal (Tuesday, October 25, 2016) – In an absolutely insane day, 22-year-old John John Florence (HAW) clinched the 2016 World Surf League (WSL) Title with a victory at the MEO Rip Curl Pro Portugal in Peniche. This is the first time a Hawaiian has held the world surfing crown since the late Andy Irons (HAW) in 2004. Florence’s season started out slowly with mediocre results across the Australian leg, including the Rip Curl Pro Bells, before posting a victory in Brazil in May. He carried the momentum of his Rio de Janeiro win to strong showings in Jeffreys Bay (2nd), Tahiti (2nd) and France (3rd) while challengers Gabriel Medina (BRA), Matt Wilkinson (AUS), Jordy Smith (ZAF) and 11-time WSL Champion Kelly Slater (USA) were unable to maintain consistency, eventually falling out of reach in Portugal. It was a tight win, with his success coming from both Medina and Wilkinson’s early round losses. “It’s been a long year, but one of the best years in my life, so many fun events and just having a really good time all together and I’ve learned so much,” he continued. “I was expecting it to go to Hawaii and I was just trying to keep surfing through heats. 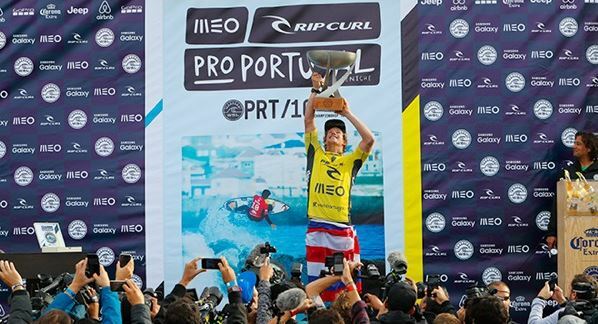 The newly crowned WSL Champion took on rookie Conner Coffin (USA) in the final of the Meo Rip Curl Pro Portugal, where the two surfers adopted different strategies for the final bout of the European leg. Florence took things to the air with numerous massive rotations while Coffin kept chasing the tubes, successfully navigating a deep one for an excellent 8.60. Florence’s flair peaked in the Final with a huge alley-oop for a 9.50 and the win. Coffin secured a career-high runner-up spot on the Championship Tour and rocketed to No. 19 on the Jeep Leaderboard. It was an extremely dramatic day in Portugal, and the result couldn’t have been better for the young Hawaiian, the newly crowned 2016 World Champion. Congratulations on your win at the Meo Rip Curl Pro Portugal, John, and welcome to the life of a World Champion!